Food Buddy Ks | Good Food-Good Friends – Food News – Recipes – Food Facts – Sharing all about food. As a “Food Enthusiast,” as many of us are, the world is just too big to know, and be able to mix ingredients for all of everywhere. But if you like quick AND delicious, take some tips from cooks who do cook at home. Sometimes the very best is made from natural, whole ingredients and sometimes mixes are thrown in to make a long task shorter and more pleasant all the way around. Most of the time, we love cooking and hope to share some of the best, old fashioned and new, recipes for new cooks to learn, improve upon and share themselves. Nothing says “fall” like corn. We like ours sweet and creamy. OK, so it’s not fall as yet, but we are getting there. Be prepared with multiple corn recipes. This side dish is a favorite around here. 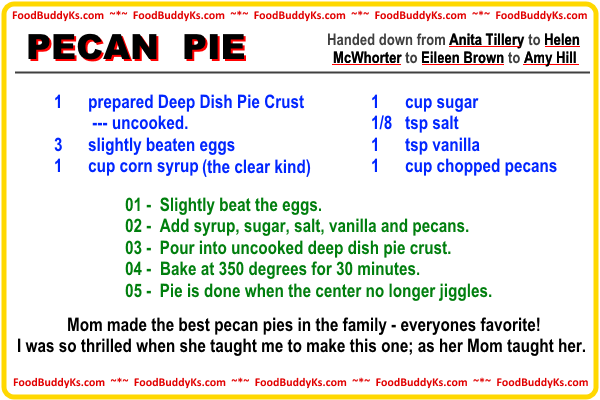 Sweet Creamy Corn Recipe from Eileen Brown – right click to download and print. 1 – Combine all ingredients in crock pot. 2 – Cook, stirring a few times, on high 2 to 2 1/2 hours or on low 4 – 5 hours. 3 – Optional – Garnish with chopped parsley. 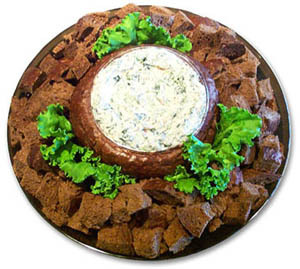 1 – Melt cream cheese and butter in a saucepan. 2 – Add milk and sugar – stir to combine. 3 – Add corn and stir to mix in sauce. Cover – low to medium heat. 4 – Cook 15 to 20 minutes until corn is tender. 5 – Stir often so as not to scorch cream cheese! 6 – Transfer to serving dish. 7 – Option – Add parsley garnish. Leftover corn reheats excellently in the microwave. It is certainly chili weather in Kansas and with the cold and blizzard conditions on the East coast right now, chili is being made by the gallons; tons if you will. We all love chili here and make giant batches so we can have lots of leftovers. Chili does get better with age in the refrigerator so huge batches are common. But how many days can you eat chili and be be completely happy? Actually a LOT of days! We smother enchiladas with chili sometimes and utilizing a side dish can make a difference too. with fries, ‘tater tots, ‘tater wedges, baked ‘taters with bacon and MORE cheese. Just a few but of course there are so many variations to go with chili, straight from a bowl. Chili Dogs a favorite for leftover Chili. Oh YEAH! Homemade chili dogs certainly makes the list of favorites at any household. Known as ‘fast food’, fattening food, artery cloggers and more, chili dogs have been given a really bad rap. But how often do you eat a chili dog or two? Once, twice or three times a year? Well, then make up for it on other days with salad. But enjoy the ones you do eat! At our house ‘finger foods’ that are messy are simply not acceptable. With handicapped folks and with kids, a chili mess with chili dogs does not make a happy dinnertime for Mom. So to forgo that mess on faces, hands and clothes, here is a solution for when Dad and/or kids BEG for chili dogs. How to UnMess Your Chili Dogs! Cheese in our infographic happens to be leftover Nacho Cheese. It was what was available, at the time. It was great too. Chili Dog plate with fries. Enjoy your chili dog plate however you like it! YUM! 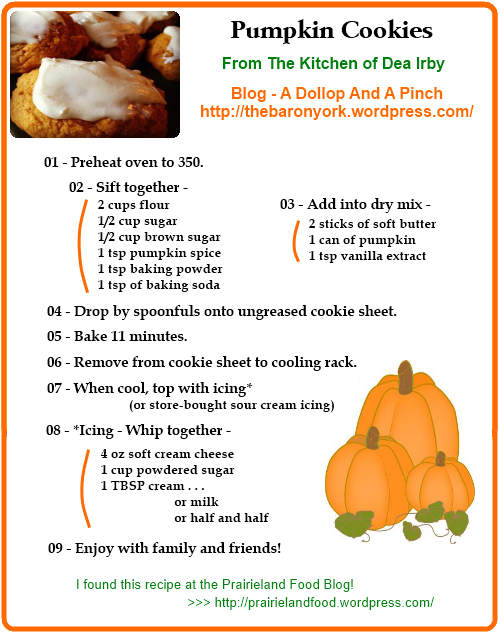 Right click and save the image (courtesy Buddy Web Services) – it is the perfect 4 x 6 size to print for your recipe box. Just cut close to the yellow border. Very close. 1 prepared Deep Dish Pie Crust – uncooked. 01 – Slightly beat the eggs. 02 – Add syrup, sugar, salt, vanilla and pecans. 03 – Pour into uncooked deep dish pie crust. 04 – Bake at 350 degrees for 30 minutes. 05 – Pie is done when the center no longer jiggles. NOTE: Mom used Karo corn syrup – the clear kind, not the dark. So that’s what I always use too. I have no idea if this particular recipe is posted anywhere else on the web. Probably it is as there can only be so many ways to make pecan pie. This is by far the best recipe though. It has been handed down in our family for generations. Just make one for yourself and you’ll agree, it is the best! This won’t sound good. I didn’t think it sounded good either when my Facebook friend, Gwen Studyvin told me about it this past week. I met Gwen for the first time, face to face, (we have SO many things in common!) and she told me about this very simple recipe. Because she raved about it, I tried it the very day I met her. Delicious! Like I said this is one of those simple and simply delicious items that are easily overlooked because when you first hear, view or read the recipe, it does not sound like the ingredients go together. The surprise is wonderful when it turns out to be good enough to serve to guests. 01 — Drain the pears and arrange on a plate or platter. 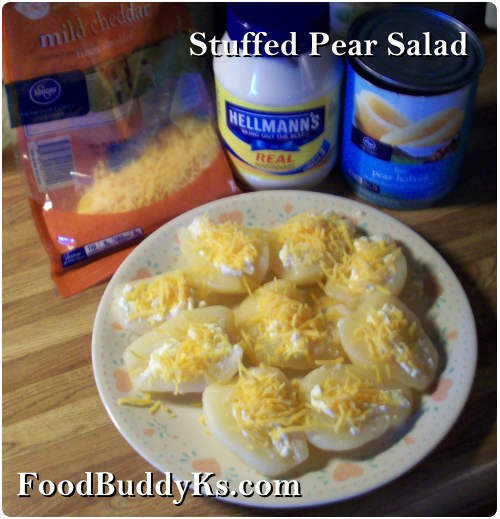 02 — Stuff each pear with about a teaspoon (or less) of Hellman’s mayonnaise. 03 — Sprinkle the shredded cheese over the top. I put two of these on my plate but went back for another one! Russ had three on his plate, but he managed to eat all the rest of the pears in this one meal! REALLY good – give it a try — it’s great food. This is an “oldie but goodie” on the food list. Old fashioned; yes. Really great meal in a casserole dish? Absolutely! I don’t know if this one is exactly like others available online, but this is how it’s made at our house. 1 – In a large skillet, cook the beef, onions and garlic; drain. 2 – Stir in gravy, vegetables, sauce, salt and pepper. 3 – Transfer to a greased baking dish. 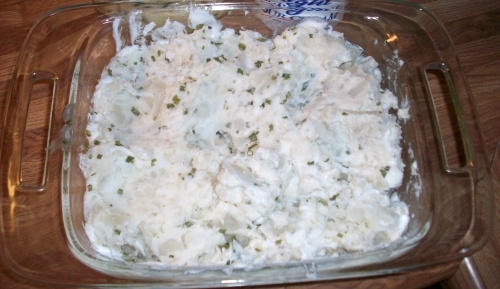 4 – Spread potatoes over the top. 5 – Bake, uncovered, at 350 for 30 minutes. Note 1 – We like to add shredded cheddar cheese to the top – last 5 to 10 minutes of baking time. for the frozen mixed vegetables when you have none in your freezer. To save image just right click and save to your hard drive. To print, place image in Word or other word processing program. My family loves corn, in all it’s incarnations. We needed a nice sweet side dish at Easter for the bone in ham and this one really filled the bill. Along with mashed potatoes, okra and a nice strawberry concoction, this corn recipe was the perfect addition. Southern Corn Casserole – Right click image and save to your hard drive to print. In a large bowl, stir together the 2 cans of corn, corn muffin mix, sour cream, and melted butter. Pour into a greased 9 by 13-inch casserole dish. Bake for 45 minutes, or until golden brown. Return to oven for 5 to 10 minutes until cheese is melted. Let stand for at least 5 minutes and then serve warm. VERY sweet – yummy! Enjoy. athletes. Why? October is Breast Cancer Awareness Month. diagnosed with breast cancer and died three years later in 1980.
passion to take a step forward. Nancy cared and acted. The world was changed. largest and best-funded breast cancer organization in the United States. U.S., 100,000 volunteers and in partnership with 50 countries. How will the world change because you care? Now, on to the food! Pink, of course. Cole slaw. one, please do that. This is a battle we must win. Work for a cure. at A Dollop and A Pinch – The Dea Irby Blog next week. “From a small Mississippi town and have lived my adult life in the south. on the web, that’s almost impossible these days! add a twist to my own recipes. OR you can copy the recipe by right clicking and saving the text below. Drop by spoonfuls onto ungreased cookie sheet. Bake 11 minutes. Remove from cookie sheet to cooling rack. As always, be truly thankful for the bounty at your own dinner table. One of the Prairieland Food directors, June Glasgow found a great little gem of information on saving berries and we’d like to share that information as it is so welcome this time of year. Blueberries, strawberries and blackberries are favorites at our home but many people really prefer raspberries when berry season rolls around. 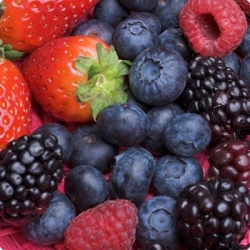 Aside from the pure joy of being visually appealing and energizing our taste centers, berries are a heart healthy food. Whatever berry you like best, it is full of anti-inflammatories, which reduce your risk of heart disease and cancer. If you’re a berry lover too, you already know that berries don’t stay fresh long, and especially raspberries seem to grow mold overnight, even when just purchased. Whatever your favorite berries are, here is a great tip to keep them fresh longer when you get them home. How to keep your berries fresh longer – a recipe for berry lovers! 1 – 1 part vinegar – white or apple cider. 2 – 10 parts water and stir around until blended. 3 – Add berries and swirl in mixture. 5 – Place in container and keep in the fridge. 10 cups water and 1 cup vinegar. Simply Living Smart – Food Storage Videos and Healthy Recipes. You folks at SLS have made our berry season brighter. When we crave something sweet and there is nothing prepared already, I bake a cake. Although there are only two of us in our household, I have relatives close by who can share with us, when the cake is still fresh and luscious. I’m not the pro mentioned in the headline. Heh. Paula Deen – People LOVE this southern bell. We love her too, down to earth and gritty even, she is the epitome of the home based southern cook. In her article on how to frost a cake, everything is in line and perfect. 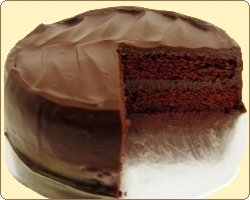 Going by her directions at PaulaDeen.com you’ll be able to frost a beautiful home baked cake without any problems. Nothing fancy, just reminds us of our own home kitchen and similar cake we like to make too. 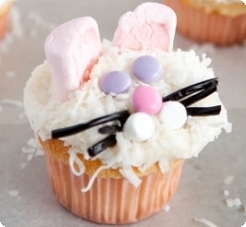 With Easter right around the corner here are a couple more things we found that we wanted to share with our baker friends. Grandma Hier’s Carrot Cake – Paula says “Not just any old carrot cake!” and from the photo it looks so unique I may be making this one for Easter dinner! Traditional Southern Deviled Eggs – I make some great deviled eggs but may have to try out Paula’s recipe as it is a tad different than my own. Egg Casserole – A novel recipe and idea for Easter. The more eggs the better! But best of all, with this recipe you have a way to use all the died eggs too. Something to go with the leftover ham or lamb. 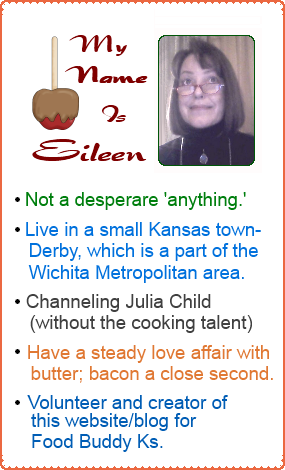 That’s not all I found great about PaulaDeen.com but you can find all the great, good and yummy recipe stuff there for yourself. Starting out to write the simple instructions for icing a cake tuned into a fun morning spent with Paula Deen. Although we all know these celebrity people are online, how often do we think to go to their individual websites and take the time to seriously look around? It really is worth the effort and time spent. 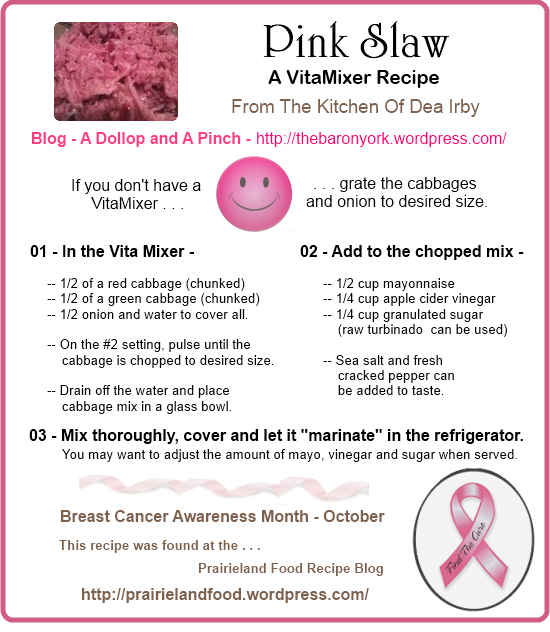 June told us in an email that her husband doesn’t like cabbage but loved this recipe when she made and served it to him. A departure from many cabbage recipes of the past. Sounds good, let’s give it a whirl! 1 – Place rice and broth in 3 quart saucepan. Bring to a boil over medium-high heat, stir. 2 – Place cabbage on top; DO NOT STIR. Cover, reduce heat to medium-low. Cook 15 minutes or until rice and cabbage is tender. 3 – Meanwhile, cook beef and onion in large skillet over medium-high heat until beef is crumbled and no longer pink, stirring occasionally. Drain. 4 – ADD undrained tomatoes, tomato sauce, sugar, and pepper to meat. 5 – Break up tomatoes with spoon. 6 – Reduce heat to medium-low, simmer about 10 minutes. 7 – When rice mixture is done, add to skillet, toss together. Note: In February we all received fresh cabbage in the Prairie Pak, discount food package from Prairieland Food. It can actually make us better cooks to take an ingredient we might not normally buy at the local grocery and hunt for or make up our own recipes. Experimentation can really be the “spice” of life, eh? It dawned on me while preparing our Sunday dinner that almost all ingredients in this meal are from our Prairieland Food Prairie Paks or specials. What better time to snap a few pictures and show you the incredible value you may glean by turning in your volunteer hours (to any entity) for about half off grocery store prices utilizing monthly discounted food packages from Prairieland Food. This was not intentional but since most all our meats come from Prairieland Food and many of our fresh fruits and vegetables too, it seemed like a no brainer to make this meal a good example of the great food and magnificent price breaks we receive. First off, we purchase a minimum of two (2) prairie paks each month and usually a special or two (sometimes more). Our freezer is almost always full with good meats and veggies from Prairieland Food so actually, for people who have to budget for everything, we eat really well. Today’s menu consisted of: 6 stuffed pork chops – baked potato casserole – broccoli, cauliflower, carrots – sliced kiwis and garlic potato bread. OH! We had company coming. Enough food for six hearty appetites. Total Cost is at the end of this article. Guess (go ahead!) how much this meal would cost if you prepared it from scratch by purchasing all the ingredients at the grocery store. Guess now, but don’t peak down there! You need to understand what a great meal this was before you find out the final, actual cost. 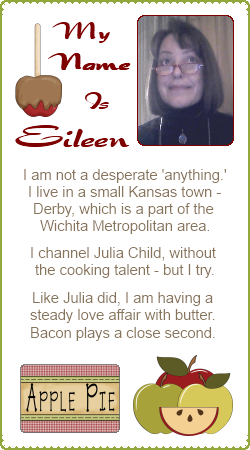 The Potatoes – (we love ’em) – Eileen’s Baked Potato Casserole with Cheddar Cheese. Topped it all off with more shredded cheddar cheese. Then it was time to heat it all up in the oven and melt the cheese on top a little. about 15 minutes at 300 degrees. Because the cheese is real, hard sharp cheddar, it does not melt like soft cheeses do and I did not want to scorch my casserole on the bottom! 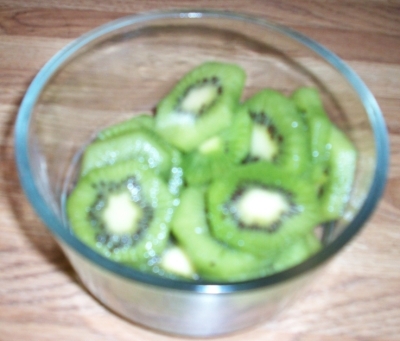 It was lovely and my grand-sugar liked this the best, well, except for the kiwis! She loves those. 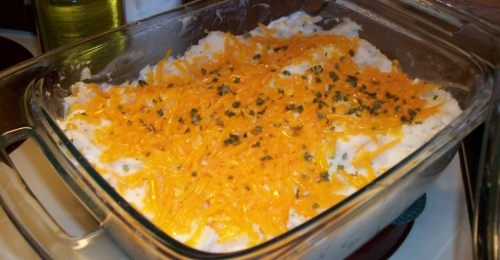 SO, for this dish the two main ingredients, potatoes and cheddar cheese came from Prairieland Food at a cost of $7.41. This price includes $2.00 for ingredients not provided by Prairieland Food. 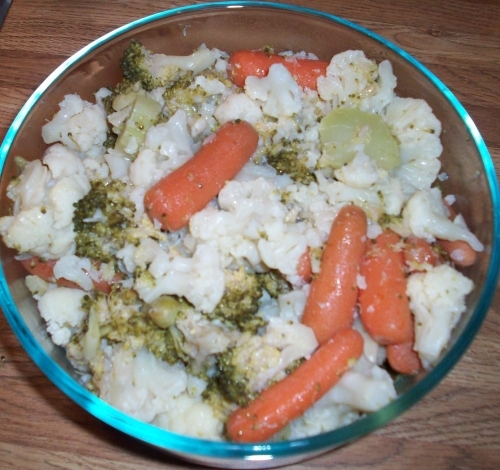 Mixed Vegetables – Broccoli, Cauliflower, Carrots – ALL fresh from Prairieland Food. In December we received 2 bags of baby carrots with our 2 Prairie Paks ordered. We used one but kept the other in the refrigerator crisper. The Broccoli and Cauliflower came in our Prairie Paks for January. We just chopped it all up; steamed in a large steamer pot, and added a little chopped chives along with a bit of butter. My DIL remarked she could sure tell the difference of my fresh veggies as compared to the frozen kind she usually buys. The cost of the vegetables total comes in at — (drum roll please!) $6.24 (this includes the butter and chives too). We still have some fresh left for another meal on some other day. The Fruit – Kiwis! Always yummy. Yikes! Blurry picture, but the only one I took, so blurry it has to be. Our kiwi’s came in at a cost for 10 at $4.16 through Prairieland Food. Perfectly ripe and delicious. Try getting 10 kiwis at the grocery store for that price! The MEAT! Six (6) Stuffed Pork Chops. I cooked these on top of the stove with enough olive oil to cover the bottom of the pan. Glass lid on with about 1/4 heat on electric stove top. Cooked about 30 minutes, turned, cooked another 30 minutes (covered). This cooks them through, but I wanted a grilled look so I drained the pan of all juices, added a bit of olive oil again, turned the heat up to medium to brown both sides. The pan I used is a chicken fryer so is bigger than a normal frying pan – It’s 11 inches wide with straight sides and is 3″ deep. 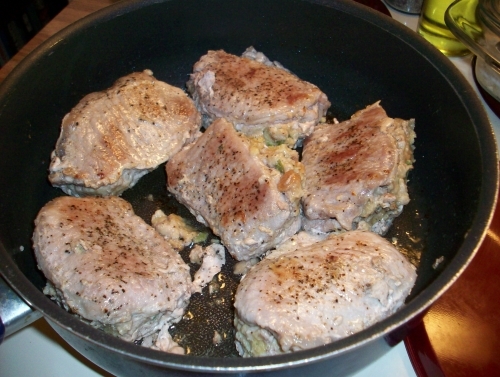 These pork chops completely filled the space when I put them in the pan, but of course, shrank a tad with cooking. Still, one is all anyone could eat. This is the priciest part of our meal. The stuffing was generous and delicious. And this was a price we don’t usually pay for meat with Prairieland Food. It was a January 2012 Special coming in at $21.00 for the six. I choose these this month as we thought: #1, we could actually afford it for a change, and #2 it has been awhile since we bought something of this quality. So that’s our Sunday Dinner from Prairieland Food and it come in at a mere $38.81. UNDER $40.00 for a meal, for six people. When was the last time you were able to do this? I thank my lucky stars each day when I am preparing our meals here at home that we have a program like Prairieland Food in Kansas. I truly don’t know what we’d do without the discounted food packages. SO, how was your Sunday Dinner? Guest Post: This post was written and provided by guest post writer, James Lander. Lander is a regular contributor for couponing and deals site, Couponing. Turn to this website for top-retailer coupon information, couponing etiquette and more. Every year Americans spend an impressive 478 billion on groceries alone. The average household stuffs at least 100 dollars a week into the cavernous pocket of their local store – relying on them for everything from diapers to midnight snacks. When it comes to the relationship between grocer and consumer, we are the embarrassingly dependent partner. It’s safe to say that if our local grocery store were our significant other, our friends would tell us to leave it. There are ways, however, to ensure you are not taken advantage of. You just need to commit to a bit more work than you may be used to. Nevertheless, when you realize that you could be saving up to three thousand dollars per year by shopping smart, you’ll probably change your tune. You know the flyers you wrinkle your nose up at and toss away? The grocery advertisements you line your birdcage with? If you are seriously interested in saving money on food, these previously ignored papers need to become your study material. You simply won’t be able to save money if you don’t know how much your products are worth. Reading these flyers will give you a clear idea of how much your chosen items are retailing for across the board and prepare you to recognize when it’s really a sale, not a scam. Before you go through those glass doors, before you are assaulted by pretty displays and delicious smells – know what you really need. As soon as you set foot in the store, you are at the mercy of in-store marketing and manipulation. Don’t let advertising erode your resolve. Having a carefully planned list, detailing the things you actually need and will use, has been proven to help curb your spending. It is so easy to fill your cart with things you ‘didn’t realize you need’ only to come home with a grocery bill almost double what you had budgeted for. The use of coupons has reached an unheard of level of popularity due to an odd mix of the current financial crisis and TLC’s half hour of ‘Extreme Couponing’ hysteria. People are realizing that the little papers they had shunned previously can save significant amounts of money when used properly. Many consumers are ‘stacking’ their coupons by waiting for the product to go on sale in the store and then combining the sale price with a manufacturer’s coupon. This can result in savings of 80% or more for seasoned couponers. As you are perusing the flyers, take the time to clip any coupons that are relevant to your lifestyle. Although you may be disturbed by the idea of a ‘discount’ grocer, there is no need to turn your nose up and spend the extra money for status. Discount grocery stores such as Grocery Outlet, Food Basics and Price Chopper offer the same food you’d purchase at mainstream stores with a 30% discount or more. The product is still perfectly fine, but may have been overstocked by other stores or slightly damaged in transit (it’s like the Nordstrom Rack of grocery stores!). When the produce is in season it is just as lovely as in other establishments and if you don’t mind a cheaper cut of meat, you can enjoy massive savings on your protein portion. If you don’t fancy the idea of cheap meat and produce, you can always ‘work the system’ at a conventional or high-end grocery store. Most meat is still fresh and edible for up to five days after the expiry date listed on the package. If you purchase the discounted meats, there’s an excellent chance that with a quick freeze, it will still be delectable a few weeks down the line. If you choose to take advantage of these steep discounts, be sure you transfer your meat into a freezer bag before storing it away. Actually handling (and smelling) your purchase is the best indication of whether your dinner needs to be fried up right away or if it can last for a few extra days. Unless you are one of the lucky (and industrious) few with a vegetable garden in your backyard and a barn full of animals, you are largely at the mercy of the grocery store. If they were to close their doors, the majority of us would eventually starve. If they were to raise their prices to a ridiculous amount, the majority of us would eventually pay it. More and more, consumers are learning the importance of being proactive when it comes to shopping. After all, if saving 50 a week eventually puts 2600 back in your wallet, is there really another option? Thank you James Lander and Couponing.com. Great tips to remember! Don’t forget, if you are a volunteer (in Kansas, Nebraska or Oklahoma), in any respect, you qualify for The Prairieland Food Discount Food Program. Happy Couponing! I’ve been making this recipe for the Holidays since the 70’s. Yeah, a really long time. family favors over many others. 3 – 10 oz pkgs frozen chopped spinach. 1 cup chopped green onions. 1 round loaf swedish rye bread, whole. 1 round loaf swedish rye bread, sliced. 1 – Thaw spinach in refrigerator overnight. as dry as possible to the touch. 3 – Place spinach in bowl and toss with salt and pepper. mayonnaise and sour cream; mix well with spoon. (one at a time) to soften the mixture to spreadable texture. amount of the spread in the newly created “bowl” of the loaf. Pumpernickel, french, italian, german rye, etc. For carb conscious folks add a plate of vegetables for dipping too. This recipe makes enough for a crowd. You will be filling the bowl often. Ooh and Aah over – never fails! 12-12-14 UPdate — Added image for 4 x 6 reipe card. Just right click and save the image, it will fit on a card, I promise! 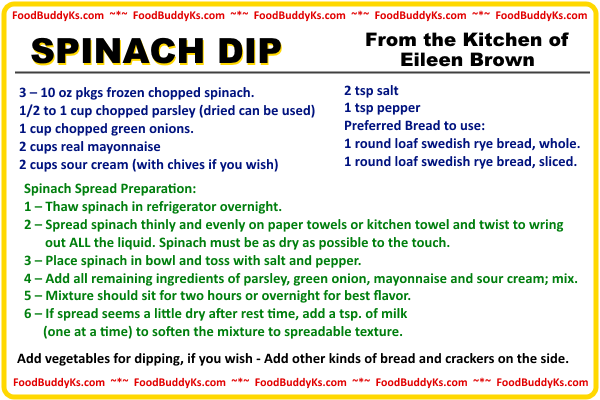 Spinach Dip/Spread Image to make a 4 x 6 recipe card. This can be found all over the internet however, we’ve been making these on New Year’s Day, when time in the kitchen is easy and not rushed. Not exactly a traditional food item but so much more healthy than packaged potato chips. And of course, no matter how we want to eat right, there is nothing quite as good as potato chips with a sandwich for lunch. It’s been many years ago that I found this online. 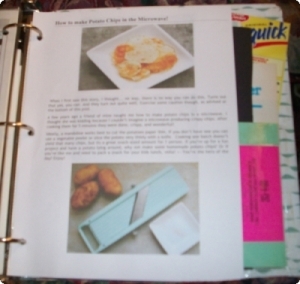 I printed it out and put it in my big kitchen notebook where I keep recipes from magazines and now those I find on the web that I actually like and make in my own kitchen. Blurry photo but snapped just a few minutes ago. I guess I should have taken several to make sure one was sharp and clear. At any rate, my recipe is two printed pages with photos. As you can see in the second pic down at left they use a mandolin to slice the potatoes. I do too, and it is the best way to get uniformly sliced potatoes for this effort. A Note here: This can be a tad time consuming if you have a small microwave for heating only. In my kitchen there is a large microwave for cooking so I have a bit of an advantage. But, if you are making potato chips for one or two people, the time is cut down considerably. Yukon Gold or red potatoes, unpeeled, scrubbed. 01 – Slice potatoes into thin (1/8-inch) rounds. 02 – Toss the slices in a medium bowl with oil and salt to coat evenly. 03 – Coat a large microwave-proof plate with cooking spray. 04 – Arrange some potato slices in a single layer on the plate. minutes depending on potato thickness and microwave power. crisp and brown around the edges, 2 to 4 minutes more. 07 – Check frequently and rearrange slices as needed to prevent scorching. 08 – Transfer the chips to another plate and allow to cool completely. 09 – They will crisp more as they cool. 10 – Repeat with the remaining potato slices. Potatoes should be golden or slightly browned to be really good, so be sure to adjust cooking times after the first batch. I almost always overcook the first batch! Also, I sometimes do peel the potatoes, depending on which type of potatoes I have on hand. On New Year’s day (this time) I’m gonna write down the time it takes on the recipe I already have in my kitchen notebook. I don’t know why I’ve not done this before! 17 days until Christmas arrives. This is one of the best times of year to teach Charity to Children. But as they say ‘charity’ starts at home. Give yourself or a family member a gift that will keep on giving. The Family Christmas Tree Skirt. For households with little ones this is a twist on the “little hand in plaster” that many parents cherish. And it is a take on “lending a helping hand” for families who may volunteer all year long. Make a Christmas tree skirt to hand down to generations to come, or as a start up for a family with a tiny wee one. The only limitation is your imagination. We also saw a suggestion to add tiny feet, how sweet! 2 – Gold, silver or glitter paint, a non-toxic type. 3 – Place paint in saucer and have child coat palm with paint. 4 – Carefully place little palm on fabric. Voila! Instant art. 5 – Add child’s name and date to each print or pair of prints. keep those paint supplies handy. as a Christmas gift for new parents or families. 1 – Buy or make a tree skirt to whatever dimensions you choose. 2 – Trace tiny hands, right and left onto plain muslin or other fabric. 3 – Embroider the outlines, add the child’s name and date; embroider. 4 – Cut out your work either in a circle or other shape. 5 – Applique (stitch) onto the tree skirt. 6 – Use glittery thread to add a little sparkle. Whatever you decide to do and to give this Christmas Season, as always, make it from the heart. 1 lb. pork sausage, browned and drained. 1 – Brown the sausage and drain. 2 – Mix together all ingredients. 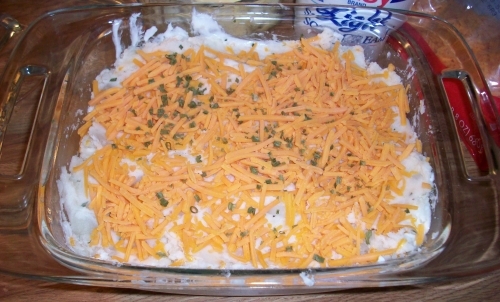 3 – Pour into a 13 x 9 x 2 casserole dish. 4 – Cover and refrigerate overnight. 5 – Bake uncovered in preheated 350 oven. 6 – Bake about one hour. An easy thing to do with this yummy recipe. Enjoy your Christmas morning more by preparing ahead! I’m not sure where this recipe came from. I’ve had it among my favorites for so long but with no notes as to whom might have passed it along. A variation does say you can substitute jicama for the apples but we always have plenty of apples so apples have always been used. 1 (13 1/4 oz) can pineapple chunks, chilled. 2 unpared apples cored and sliced. 2 oranges, peeled and sectioned. 1 (8 oz can) whole beets, chilled, drained and sliced. 3/4 cup coarsely chopped peanuts. 1/2 cup salad or olive oil. 3 Tblsp. Lime juice or vinegar. (I sometimes use wine vinegar). 1 – Use a shallow but large salad bowl. 2 – Place romaine in salad bowl. 2 – Drain pineapple but reserve juice. 5 – Sprinkle with peanuts and pomegranate seeds. 6 – Shake together oil, lime juice (or vinegar), sugar and salt. 7 – Pour over salad and toss gently. good addition. Little kids don’t much like the onions though. fruit and vegetable salad that does not include whipped topping. 22 days until Christmas arrives. Giving gifts of love to ones family and friends can be as easy as baking something fresh and delivering it in a Christmas Tin. Many folks bake at Christmas even when they do not enjoy this activity the rest of the year. Additionally, homemade gifts are cherished and kept, almost always by the recipients. It is particularly nice when the present comes from a child in your family. The gift actually means something and will more than likely adorn the wall, mantelpiece or shelf of a loved one for years to come. Who has time for this? Many folks simply do not have the time these days and making the time, when there is only 22 days left to go, means jockying sometimes already full Christmas party schedules. So, with this in mind here are a few tips to shop from home using your computer, to help you stay warm while shopping. Don’t forget that orders have to be made, shipped and then wrapped, so take an afternoon very soon to shop online. · Personalized t-shirts, hats, mugs, etc. are a great way to make what is usually a pretty standard Christmas gift into a more enduring and meaningful gift. The process for arranging this sort of gift is fairly easy and can be done in most cases simply by sending off a relevant photo. The end result shows the actual effort you put in. · To make a point with a personalized Christmas gift why not go for a private license plate? For a new motorist or a seasoned driver with a new car, a personalized plate would be a perfect gift. You can also buy those “sayings” plates for the other end of the auto. · A photo frame of the digital variety is a great modern take on a classic heartfelt present. By loading up the frame with snapshots of friends and family, you can take the hassle out of the technology for a loved one and give them a gift that will always be fresh. · Since everybody likes to relax at home over the Christmas period, giving the gift of chocolate is always a winner. On Christmas morning a refined chocolate present, with a personalised message, from a good chocolatier is a great way to give a custom gift. Lastly, take an afternoon to do the baking we talked about earlier – cookies, candies, and items that will keep well in a tin should be on the menu. Whatever you decide to do and to give this Christmas Season, make it from the heart. 1 lg Onion – peeled and cut in pieces. 1/2 cup Maple Syrup, can be sugar free. 1 – Place chicken in baking dish. 2 – Sprinkle with pepper. 3 – Place onion pieces around chicken. 4 – Pour sauce over chicken. 5 – Place in 375 degree oven. 6 – Bake until done, about 45 minutes to one hour. recipes will be appearing here! 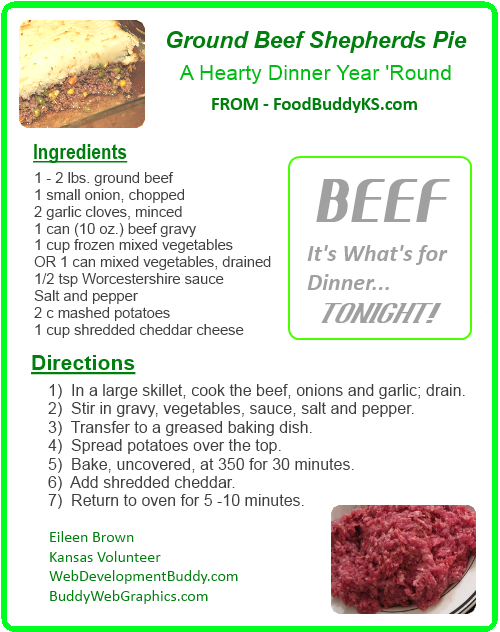 See Prairieland Food Derby for archived Prairie Pak contents! Thanksgiving Day – Joyous Work! Thanksgiving Day – The Joyous Work Web Log! A dialog for this joyous family day; as much as there is time for. Giving thanks for another Thanksgiving with family. 5:00 am – turkey out of frig and prepared for microwave and returned to frig. Yes, I cook mine in the microwave. Once you learn that cooking can be made easier utilizing the most amazing microwave, your life as a cook, will be happier. The microwave turkey has always been moist, and done to perfection. Directions on how to do this at another time. I don’t just “heat” things up in mine. I really cook in it. 6:00 am – cleaning house – the last minute touches. 7:00 am – wrote an article for this blog! Where did the mind set for this come from? Dunno, just did it as it was nice to set down for awhile. My back need this break. Here is the article: Teaching Charity to Children Through Volunteerism. 8:00 am – chopping onions and celery for the two dressings. 9:00 am – Made a very light brunch of egg, pastrami, havarti cheese, tomatoes and lettuce on swedish rye bread for both of us – no more food until the Thanksgiving appetizers come out in a few hours. Russ had strawberry soda with his instead of milk. Like a kid, it was a real treat for him. He had a choice and that’s what he chose. Go figure. 12 Noon – well, 4 minutes till anyhowsen. Stuffing is on it’s way to a plug in appliance. I never put it in the oven anymore. Once it’s done on the stove top I add a little more juice and add it to a big flat (about 6 inches deep tho’) covered appliance on low. With two kinds of dressing this year I’ll make a tin foil divider to keep the herb dressing separate from the cornbread stuffing. Our cornbread stuffing gets boiled eggs chopped in it (along with the chopped onions and celery of course) and the herb dressing get the usual treatment, plus a LOT of extra sage. My brother in MN called to wish us a Happy Thanksgiving just before I needed to sit down again. I told him, “I cannot believe how HOT that kitchen gets when cooking this much food!” And it’s the truth too. Yikes. 8:55 pm – Once the party here was rolling, there was not any way to get back here to update. That is good news for our family though. Dear DIL showed up on time to help me de-bone the turkey which was falling off the bone tender by 2:00 pm. Wonderful and juicy the bird is always center stage. What can I say? We had a grand time, overate, and almost cleaned up everything. There are still some dishes sitting with water in them, ready to be washed and put away. I send enough dressing and turkey home with the kids for their families that we don’t have to have it for weeks. But I bet we do have a good weeks worth of food, without doing anything but heating a plateful in the microwave. I like it like that too. I need a few days rest after the push to get this giant meal ready on time. It was worth it though, as it always is. Volunteers do more than help other people or their communities. They teach, by example, charity to their children. With all the hustle and bustle that surrounds the holidays each year, we can forget important things that don’t make it onto our printed calendars. November 20 was National Family Volunteer Day. We did not forget the day but preparing for Thanksgiving does rush us along and this very important day can be overlooked. What better way to kick off the Holiday Season than to teach, by our very own examples, just how volunteerism helps our neighbors and communities grow and flourish. The volunteer spirit is born in most of us. As we grow older, we realize that there is no better way to grow healthy, happy families than to share and care. By exhibiting a giving spirit; a loving and caring hand; and smiles (instead of scowls) to those less fortunate than ourselves, it is possible to ingrain the volunteer spirit into our family life. How to spread the volunteer spirit. Here is southern Kansas, in the Wichita metro area we have some great services where extending that helping hand is always welcome. The Lords Diner, now at two locations, feeds hungry families but also depends on volunteers to help accomplish the task. Places to volunteer abound here, really, but let’s take a step back and see what we can do to teach children how to spread their giving spirit. Work together to make baked goods as a donation to a church, community or charity fair. Help your child donate a portion of his allowance and birthday money to the charity of his choice. Instead of exchanging duplicate gifts – donate one of the items to charity. Encourage your children to donate one item off their Christmas or birthday wish list to a less fortunate child. Teach a class together. Senior centers, YMCAs and women shelters are very receptive to the help. Walk, brush, feed and clean pets at a rescue shelter. Even younger children can appreciate this action. Volunteer to read to the blind. Let older children read while the younger ones turn pages. Organize a food drive in your neighborhood. Even small children can help deliver and collect bags. Organize a toy, book or clothing drive. Have the kids chip in by donating some of their unused toys and outgrown clothing. Volunteer with Habitat for Humanity. Volunteers are needed to build, paint, cook and serve food, watch children and more. Sign up to receive Habitat’s free newsletter for monthly updates and share it with your children. Help an elderly neighbor with shopping . Let your child carry the grocery list and decide on “gift” items not on the list. Help an elderly neighbor with yard clean up. When a whole family pitches in, the work is done in half the time. If you don’t have a Goodwill drop-off nearby, donate old clothes to a community church clothing bank. Have your children help with this activity. Allowing your children to help you help others is what it is all about. There is another list here at the Prairieland Food Blog that might also help you find an activity to help teach about volunteerism on the “Are you a volunteer?” page. However you choose to teach charity to children, whether your own; a scout troop; a sports team or club you monitor, this action is more than worth the effort. Even if all you do is on one day during the year, make that whole day about giving freely of your time to others, in some capacity. November 20, next year, could be the day your child learns about charity for the long term. But even better, how about one day a month? Don’t get stuck on what day your calendar expresses what you should do, but what you feel in your heart. Could passing that “good spirit” feeling on to your child be worth a mere 12 days a year? You bet’cha. Prairieland Food recognizes that volunteers are an important part of every good community. Offering discounted food packages to those with a truly giving spirit is the mission of the organization. Allow your child to accompany you to D-Day, when the food comes in, and when you can, donate a Prairie Pak to someone you know needs that helping hand. Your child being a part of this action, will learn about charity first hand, from your example. We feel privileged to be able to have what we want at this very important family meal. So many folks don’t have this choice. When you give your “Thanksgiving Prayer” don’t forget to ask for bounty for all citizens of the earth and of course – Be truly thankful. I cook the big bird each year and even though I’ve cooked an untold amount of turkeys, I look this information up almost every year. Luckily, all you need to know can be found online. But to make sure we get the right scoop and handle those turkeys in a safe manner here is what the real experts have to tell us. 1 – Allow 1 pound of turkey per person. 2 – Keep frozen until you’re ready to thaw it. however, cook within 1 year for best quality. 4 – See “Thawing Your Turkey” for thawing instructions. 3 – in the microwave oven. 1 - Keep the turkey in its original wrapper. 2 - Place it on a tray or in a pan to catch any juices that may leak. 3 - A thawed turkey can remain in the refrigerator for 1 to 2 days. to leak through the wrapping. 2 - Submerge your wrapped turkey in cold tap water. 3 - Change the water every 30 minutes. 4 - Cook the turkey immediately after it is thawed. 5 - Do not re-freeze. 3 - Remove all outside wrapping. 5 - Cook your turkey immediately. thawing in the microwave oven. Remove the giblets from the turkey cavities after thawing. Set your oven temperature no lower than 325 °F. For optimum safety, stuffing a turkey is not recommended. For more even cooking, it is recommended you cook your stuffing outside the bird in a casserole. Use a food thermometer to check the internal temperature of the stuffing. The stuffing must reach a safe minimum internal temperature of 165 °F. If you choose to stuff your turkey, the ingredients can be prepared ahead of time; however, keep wet and dry ingredients separate. Chill all of the wet ingredients (butter/margarine, cooked celery and onions, broth, etc.). Mix wet and dry ingredients just before filling the turkey cavities. Fill the cavities loosely. Cook the turkey immediately. Use a food thermometer to make sure the center of the stuffing reaches a safe minimum internal temperature of 165 °F. A whole turkey is safe when cooked to a minimum internal temperature of 165 °F as measured with a food thermometer. Check the internal temperature in the innermost part of the thigh and wing and the thickest part of the breast. For reasons of personal preference, consumers may choose to cook turkey to higher temperatures. If your turkey has a “pop-up” temperature indicator, it is recommended that you also check the internal temperature of the turkey in the innermost part of the thigh and wing and the thickest part of the breast with a food thermometer. The minimum internal temperature should reach 165 °F for safety. Use the timetables below to determine how long to cook your turkey. These times are approximate. Always use a food thermometer to check the internal temperature of your turkey and stuffing. It is safe to cook a turkey from the frozen state. The cooking time will take at least 50 percent longer than recommended for a fully thawed turkey. Remember to remove the giblet packages during the cooking time. Remove carefully with tongs or a fork. Add ½ cup of water to the bottom of the pan. If your roasting pan does not have a lid, you may place a tent of heavy-duty aluminum foil over the turkey for the first 1 to 1 ½ hours. This allows for maximum heat circulation, keeps the turkey moist, and reduces oven splatter. To prevent over browning, foil may also be placed over the turkey after it reaches the desired color. If using an oven-proof food thermometer, place it in the turkey at the start of the cooking cycle. It will allow you to check the internal temperature of the turkey while it is cooking. For turkey breasts, place thermometer in the thickest part. For whole turkeys, place in the thickest part of the inner thigh. Once the thigh has reached 165 °F, check the wing and the thickest part of the breast to ensure the turkey has reached a safe minimum internal temperature of 165 °F throughout the product. If using an oven cooking bag, follow the manufacturer’s guidelines on the package. REMEMBER! Always wash hands, utensils, the sink, and anything else that comes in contact with raw turkey and its juices with soap and water.